Every year during holi festival, we throw colour on each other and play with colors for hours. But why do we do play with color. The scriptures give us answers in the form of the story associated with Prahlad and also of Lord Krishna and Radha. 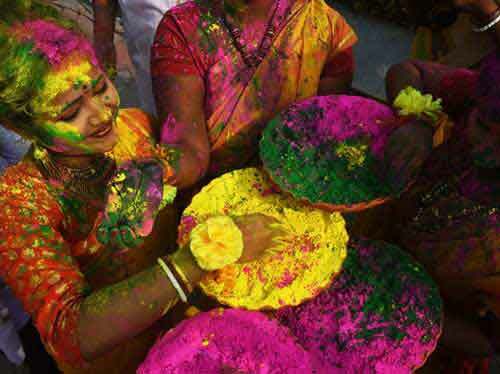 But is there any scientific reason for throwing colors on each other – the natural colors abir or gulal. Some people are of the opinion that Holi which is celebrated during the spring time and it also the period when chicken pox and some other skin diseases are more common. Gulal is a substance which is a good repellent of chicken pox germs. Therefore, applying it on our skin is believed to help in keeping away chicken pox germs and other germs affecting skin. Note - The gulal that is good for your skin is naturally made from flowers and leaves - what you get in the market during holi usually is a chemical powder and it contains silica and this is harmful to the eyes and skin.